Round 7 most important game was a victory of Halcones over 4th placed Aguilas 80-68 on Sunday night. Halcones forced 19 Aguilas turnovers. They looked well-organized offensively handing out 21 assists. Worth to mention a great performance of American-Puerto Rican Wil Martinez (188-92, college: Fairmont St.) who helped to win the game recording 24 points. The former international forward Anell Alexis (200-90, college: Marist) contributed with 11 points, 6 rebounds and 5 assists for the winners. 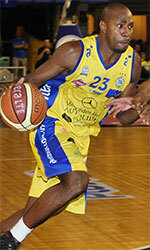 American swingman Lovell Cook (201-90, college: New Orleans) answered with 23 points for Aguilas. Both coaches used bench players which allowed the starters a little rest for the next games. Halcones have a solid series of three victories in a row. They moved-up to second place. Aguilas at the other side dropped to the third position with three games lost. They share it with Panteras. Important game to mention about took place in Aguadulce. First ranked Correcaminos (6-1) saved a 2-point derby victory on the road edging 5th ranked Caballos (2-5) 85-83 on Saturday evening. It was a great evening for the former international point guard Trevor Gaskins (188-89, college: Louisiana Tech, agency: Pro Sports) who led his team to a victory with a double-double by scoring 24 points and 11 assists. Bartel Lopez helped adding 15 points and 13 rebounds (on 7-of-9 shooting from the field). At the losing side naturalized American point guard CJ Rodriguez (188-94, college: S.Nazarene) responded with a double-double by scoring 23 points, 10 rebounds and 9 assists. Defending champion maintains first place with 6-1 record. Caballos lost third consecutive game. They keep the fifth position with five games lost. A very close game took place in Panama City between Aguilas and Panteras. Fourth ranked Aguilas (4-3) got a very close home victory over 3rd placed Panteras (4-3). Aguilas managed to escape with a 1-point win 79-78 in the fight for the third place. It ended at the same time the three-game winning streak of Panteras. It was an exceptional evening for Jonathan King who led the winners and scored 18 points, 7 assists and 6 steals. Aguilas' coach Franklin Holness used a ten-player rotation in such tough game. Luis Dinolis came up with 24 points and 6 assists for Panteras in the defeat. Aguilas moved-up to third place, which they share with defeated Panteras. LPB top team - Correcaminos (6-1) had no problems winning another game. This time they beat sixth ranked Toros (0-7) in David 80-64. Terrence Shannon fired a double-double by scoring 26 points, 11 rebounds and 5 assists for the winners. Correcaminos' coach Casimiro Laguna used entire bench and allowed the starting five to rest. Defending champion maintains first place with 6-1 record. Toros at the other side still closes the standings with seven games lost. Bottom-ranked Toros is still unable to win any game. This time they could not use their home court advantage losing their seventh consecutive match to third ranked Panteras (4-3) 61-55 on Saturday evening. It was a very good performance for B Martinez who helped to win the game recording a double-double by scoring 14 points and 16 rebounds. Panteras have a solid series of three victories in a row. They maintain third place with 4-3 record having just two points less than leader Correcaminos, which they share with Atletico Nacional. Loser Toros still closes the standings with seven games lost. In the last game of round 7 Universitarios beat Caballos on the road 87-76. LPB top team - Correcaminos (6-1) had no problems winning another game. 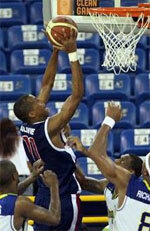 This time they beat sixth ranked Toros (0-7) in David 80-64. 24 personal fouls committed by Toros helped opponents get some easy free throw opportunities. American forward Terrence Shannon (203-79, college: Elgin CC, agency: DTMones) fired a double-double by scoring 26 points, 11 rebounds and 5 assists for the winners. The former international swingman Isaac StRose (190-83, college: John Brown) chipped in 10 points and 6 rebounds. Four Correcaminos players scored in double figures. Correcaminos' coach Casimiro Laguna used entire bench and allowed the starting five to rest. Gil Atencio (202-96, college: St.Clair) produced 19 points and 6 rebounds and point guard Joel Munoz (183-80) added 12 points and 10 assists respectively for lost side. Defending champion maintains first place with 6-1 record. Toros at the other side still closes the standings with seven games lost. No shocking result in a game when third ranked Halcones (5-2) beat 5th ranked Caballos (2-5) in Aguadulce 87-76 on Wednesday. Halcones forced 23 Caballos turnovers. They looked well-organized offensively handing out 21 assists. Caballos were plagued by 27 personal fouls down the stretch. It was a very good performance for forward Michael Hicks (196-76, college: Texas A&M-CC) who helped to win the game recording 30 points, 7 rebounds, 4 assists and 4 steals. American-Puerto Rican Wil Martinez (188-92, college: Fairmont St.) contributed with 25 points for the winners. Naturalized American point guard CJ Rodriguez (188-94, college: S.Nazarene) answered with a double-double by scoring 21 points, 9 rebounds and 10 assists and Nigerian-American power forward Ike Okoye (206-86, college: Boise St.) added 14 points and 7 rebounds in the effort for Caballos. Four Caballos players scored in double figures. Caballos' coach David Rosario rotated eleven players in this game, but that didn't help. Halcones have a solid series of three victories in a row. They moved-up to second place. Caballos lost third consecutive game. They keep the fifth position with five games lost. A very close game took place in Panama City between Aguilas and Panteras. Fourth ranked Aguilas (4-3) got a very close home victory over 3rd placed Panteras (4-3). Aguilas managed to escape with a 1-point win 79-78 in the fight for the third place. It ended at the same time the three-game winning streak of Panteras. Strangely Panteras outrebounded Aguilas 50-36 including 35 on the defensive glass. They looked well-organized offensively handing out 24 assists. It was an exceptional evening for Jonathan King (193-90, college: Abil.Christian) who led the winners and scored 18 points, 7 assists and 6 steals. American swingman Lovell Cook (201-90, college: New Orleans) accounted for 19 points, 5 rebounds and 4 assists for the winning side. Aguilas' coach Franklin Holness used a ten-player rotation in such tough game. Luis Dinolis (185-93, college: Broward CC) came up with 24 points and 6 assists and B Martinez (202) added 12 points and 19 rebounds respectively for Panteras in the defeat. Both teams had four players each who scored in double figures. Aguilas moved-up to third place, which they share with defeated Panteras. Important game to mention about took place in Aguadulce. First ranked Correcaminos (6-1) saved a 2-point derby victory on the road edging 5th ranked Caballos (2-5) 85-83 on Saturday evening. Correcaminos made 17-of-20 charity shots (85.0 percent) during the game. Their players were unselfish on offense dishing 24 assists. Correcaminos brought some defensive toughness making 9 blocks. It was a great evening for the former international point guard Trevor Gaskins (188-89, college: Louisiana Tech, agency: Pro Sports) who led his team to a victory with a double-double by scoring 24 points and 11 assists. Nicaraguan center Bartel Lopez (212-89) helped adding 15 points and 13 rebounds (on 7-of-9 shooting from the field). At the losing side naturalized American point guard CJ Rodriguez (188-94, college: S.Nazarene) responded with a double-double by scoring 23 points, 10 rebounds and 9 assists and Puerto Rican point guard Alvin Cruz (186-82, college: Niagara) scored 19 points, 9 rebounds and 4 assists. Five Correcaminos and four Caballos players scored in double figures. Defending champion maintains first place with 6-1 record. Caballos lost third consecutive game. They keep the fifth position with five games lost. Round 7 most important game was a victory of Halcones over 4th placed Aguilas 80-68 on Sunday night. Halcones forced 19 Aguilas turnovers. They looked well-organized offensively handing out 21 assists. Worth to mention a great performance of American-Puerto Rican Wil Martinez (188-92, college: Fairmont St.) who helped to win the game recording 24 points. The former international forward Anell Alexis (200-90, college: Marist) contributed with 11 points, 6 rebounds and 5 assists for the winners. Four Halcones players scored in double figures. American swingman Lovell Cook (201-90, college: New Orleans) answered with 23 points and Jonathan King (193-90, college: Abil.Christian) added 11 points and 6 assists in the effort for Aguilas. Both coaches used bench players which allowed the starters a little rest for the next games. Halcones have a solid series of three victories in a row. They moved-up to second place. Aguilas at the other side dropped to the third position with three games lost. They share it with Panteras. Bottom-ranked Toros is still unable to win any game. This time they could not use their home court advantage losing their seventh consecutive match to third ranked Panteras (4-3) 61-55 on Saturday evening. Panteras held Toros to an opponent 24.6 percent shooting from the field compared to 36.8 percent accuracy of the winners. Toros were plagued by 28 personal fouls down the stretch. It was a very good performance for B Martinez (202) who helped to win the game recording a double-double by scoring 14 points and 16 rebounds. Puerto Rican guard Jorge Matos (185-92) contributed with a double-double by scoring 12 points, 10 rebounds and 4 assists for the winners. Naturalized American Antonio Bumpus (192-89, college: Cumberlands) answered with 24 points and 6 rebounds and American center Wilbur ONeal (201-88, college: Indianapolis) added 13 points and 9 rebounds in the effort for Toros. Panteras have a solid series of three victories in a row. They maintain third place with 4-3 record having just two points less than leader Correcaminos, which they share with Atletico Nacional. Loser Toros still closes the standings with seven games lost.